Roof decking, also known as roof sheathing, is the roofing material that sits between the structural components and the outer roofing layers. We take a closer look at this essential part of every roofing system. The roofing structure, which includes the trusses, joists, and rafters, form what is essentially the skeleton of the roofing system. The roof deck installs directly onto the roof structure, creating an even plane where the other materials are attached to. Note that the decking material has to be strong enough to hold the roof’s weight; roofing materials like slate and tile are several times heavier than typical asphalt shingles. During a roofing replacement process, roofing contractors typically strip the roof down to the roof deck. Often the decking is left intact and is kept for the new roof. The underlayment or roofing felt is directly installed on it, followed by additional leak barriers, then the outer roofing material. There are several types of roof decking material, the use of which depends on factors such as the kind of outer roofing material and the spacing between rafters. Plywood – This is the most common decking material. It’s strong, durable and light, plus it holds roofing nails well. It is made of alternating layers of different wood types, with the outer layer generally being the higher grade. Oriented Strand Board – Used interchangeably with plywood, OSB is made of compressed strands of wood and water-resistant adhesives. It generally costs less than plywood, which makes it ideal for large-scale asphalt shingle or metal roof installation. Tongue and Groove – This is basically lengths of thick wood that are stacked side-by-side along the rafters. The cross-section of each length looks very much like a piece of a jigsaw puzzle—one piece’s edge fits the other’s groove. This material is ideal for homes that do not have an attic space, as the wood is thick enough to provide insulation. A similar material called V-rustic boards are also available. 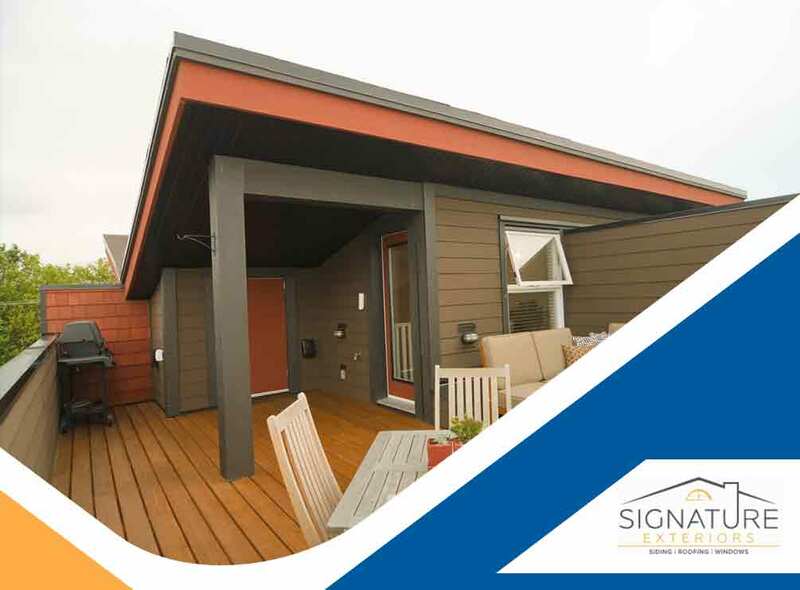 To learn more about our roofing products and services, call Signature Exteriors today at (866) 244-8029. You can also fill out our contact form to schedule a free quote. We serve Stamford, Greenwich, and Danbury, CT.